Our documents and videos are great for learning about CharityMania, or when presenting the details of our fundraisers at a board meeting. This is a great document to print out and share at your next meeting to discuss why a CharityMania fundraiser would be right for your organization. It includes all the pertinent information about our fundraiser and how they work. You can also include the Fact Sheets from the next section for the specific fundraisers you are interested in. These one-page sheets are great for organizers who need to discuss the fundraiser with people who are not familiar with CharityMania fundraisers. The fact sheets contains all the important facts about the fundraiser. 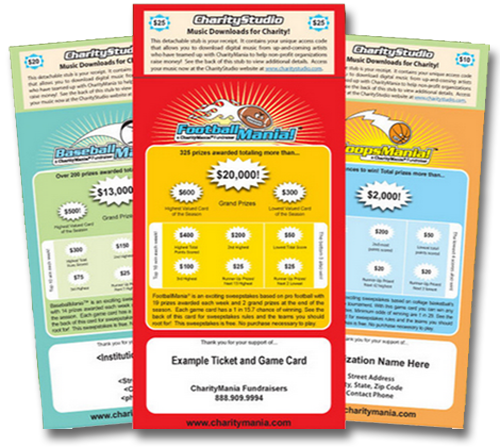 We recommend that you print out the overall CharityMania brochure, and then the fact sheet and example ticket (below) for every fundraiser that you plan to discuss. The following videos provide a quick, detailed overview for each of our sweepstakes. Each video is about 2 to 3 minutes long and is hosted on YouTube. We think the videos are the best way to learn how our unique sweepstakes work. Enjoy!